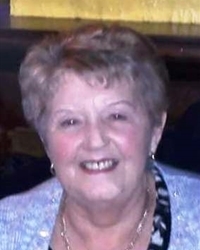 Her remains will leave her late residence 6, Slieve Gullion Road, The Meadow, on Sunday at 10.15am for 11.00am Funeral Mass in St. Mary’s Church, Chapel Street, burial afterwards in the adjoining cemetery. Deeply regretted and sadly missed by her sons, daughter-in-law Margaret, grandchildren, great grandchildren also her sister Patricia, brother Karl and the entire family circle. I am sorry to tell you that May McVeigh/Trainor has passed away.